Marvel Studios Black Panther broke many records in it’s opening weekend. This film is a certified smash and is the highest rated superhero movie on Rotten Tomatoes (97%). Here are a few behind the scenes photos and fun facts about the film. 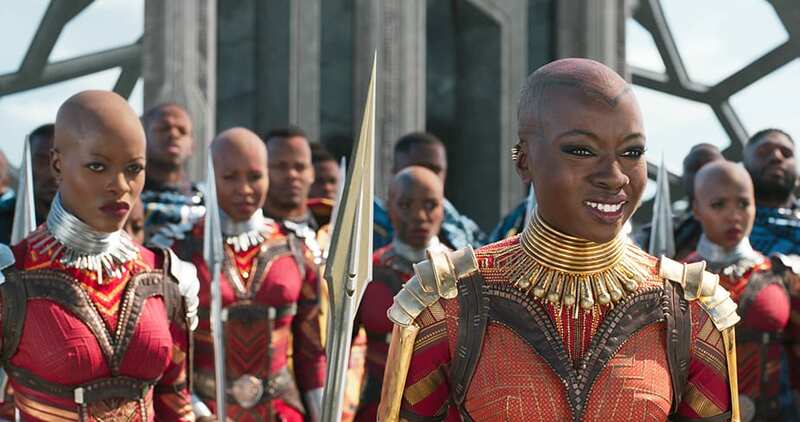 An important part of the Black Panther lore incorporated into the film is the Dora Milaje, the cadre of strong fierce women who serve as the personal security force to the King and royal family. These tall, statuesque, bald-headed warrior women, who move as one, command attention wherever they go. Led by Danai Gurira’s character, Okoye, the Dora Milaje security force features an international contingent of women from all over the world, including Florence Kasumba who returns to play Ayo, a character that first appeared in Marvel Studios’ “Captain America: Civil War.” The Dora Milaje were cast from a pool of actresses, stunt women and Broadway dancers so that each individual Dora could have specialized skills that they brought to the table. It was decided early on that Xhosa, one of the official languages of South Africa, would be the language of Wakanda. 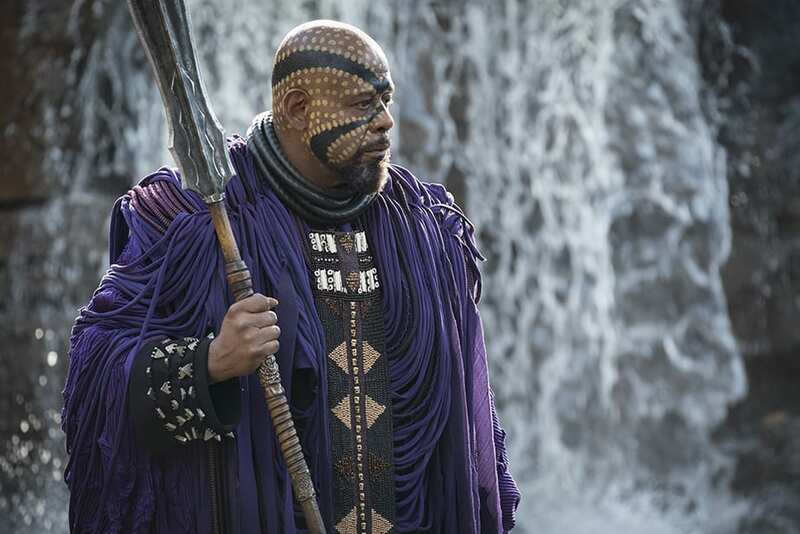 A precedent had been set in Marvel Studios’ “Captain America: Civil War,” when celebrated South African actor John Kani, who portrayed King T’Chaka, used his native accent. Chadwick Boseman, who plays T’Challa/Black Panther, picked it up from him as well. The cast and stunt team practiced with African drums played by musician Jabari Exum so that their movements would have a musical quality found in many African-based martial arts. The cast did the bulk of the fight work that will be seen on film. 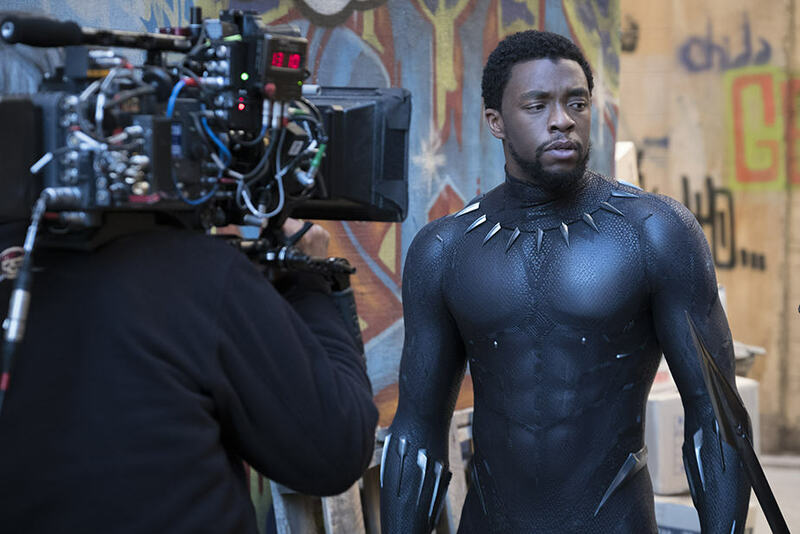 Chadwick Boseman, whose skill set includes a comprehensive martial arts background, knew what he was in for when he and all the other actors had to attend a “boot camp” to prepare them for the physical aspects of their roles. 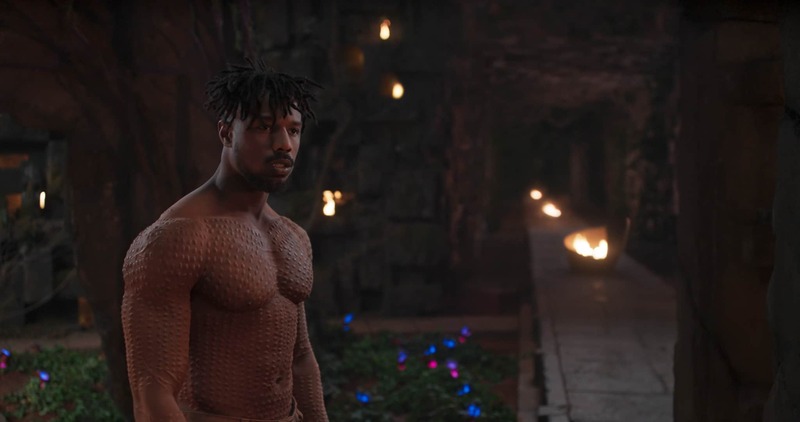 Michael B. Jordan, who plays Erik Killmonger, spent about two and a half hours in the special effects makeup chair every day, while makeup designer Joel Harlow and three other makeup artists applied close to 90 individually sculpted silicone molds to his upper body. This “scarification” application process entails transferring each mold and then blending and painting them to match Jordan’s skin tone. Each of Killmonger’s scars represents a “notch” of his kills over the years. The Warrior Falls set was 120’ x 75’ in size. 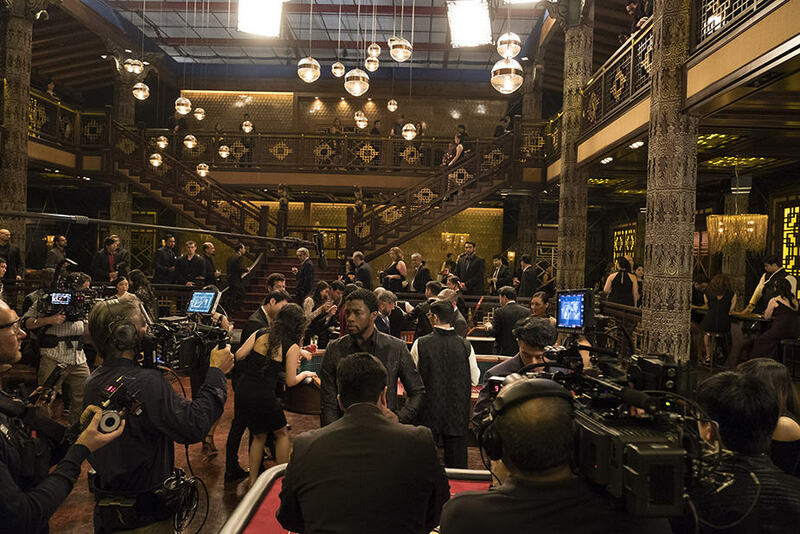 The set was 36’ tall, with the pool being six feet above ground level. That made the cliff faces 30’ tall. Construction took about four months from start to finish. 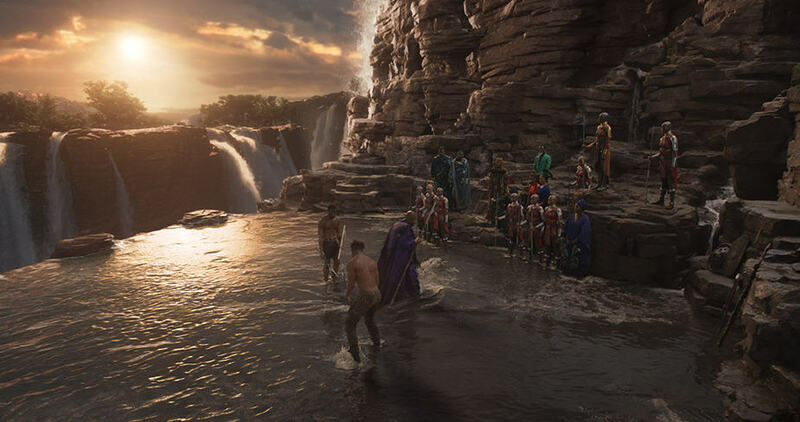 Over 25,000 cubic feet of foam was used in the Warrior Falls set, which was sculpted to match the rocks in Oribi Gorge in South Africa. The bottom of the Warrior Falls’ Challenge Pool was padded for the stunt team, but still looked like rock. The production crew also had to formulate a surface that was rough enough to not be too slippery in bare feet, but not so rough that it hurt to land on it. On the Warrior Falls set, the stunt team had to rig all of the cliff faces with mountain climbing gear to safely secure all of the extras on the cliff faces. The production team engineered a fully functional flowing waterfall and pool at the ledge of the cliff with six large submersible pumps feeding over 125,000 gallons of temperature-controlled water piping up through the set at a rate of 30,000 gallons per minute before recirculating through the system. 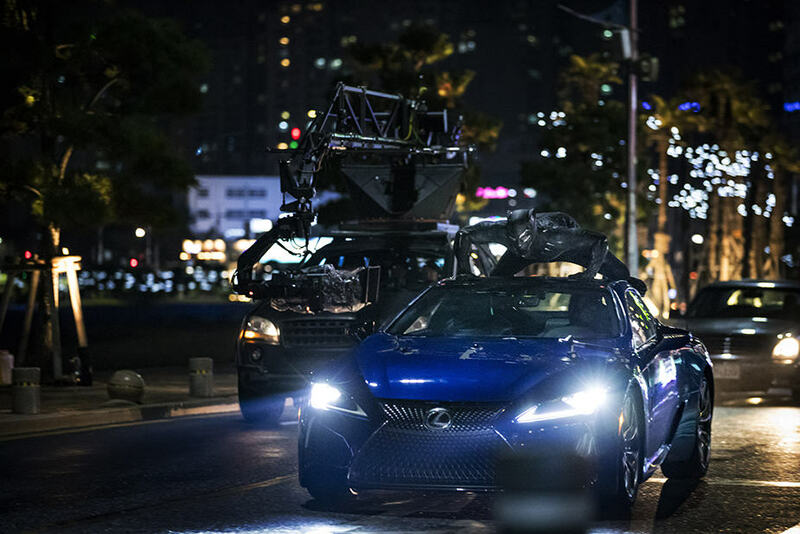 The high-speed car action for the Casino sequence was filmed on location in the bustling coastal city of Busan, South Korea. 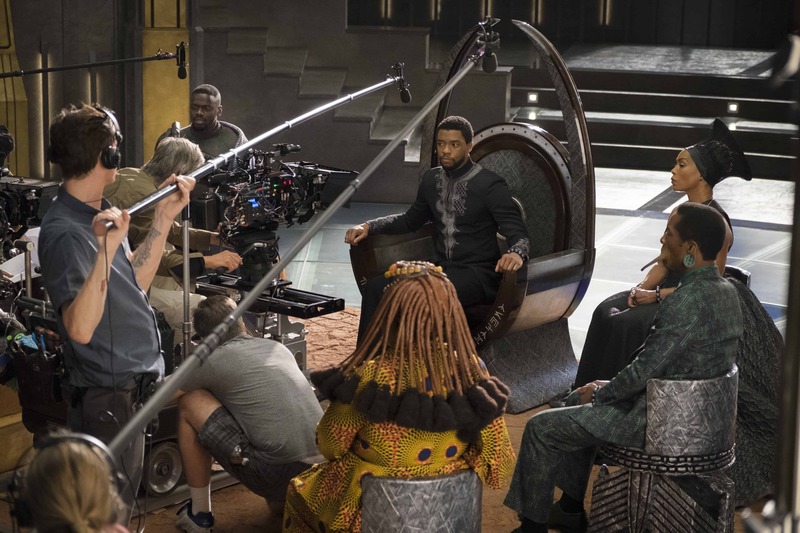 For almost two weeks, “Black Panther’s” action unit descended upon the coastal city nestled against the foothills of Geumjeong Mountain to film the thrilling, mind-blowing chase sequence through such iconic sites as Gwangalli Beach and the Haeundae District. Director Ryan Coogler wanted the South Korea action sequence to be seamless, so he had an editor on set cutting footage in real time. 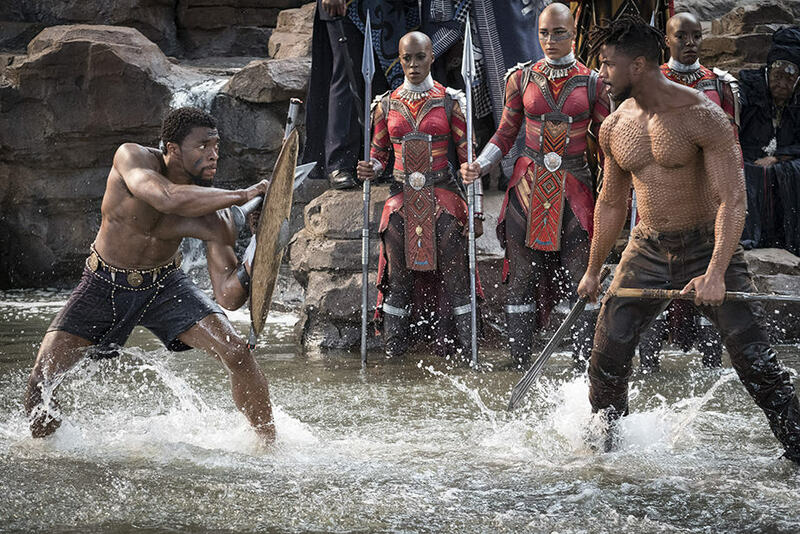 This is not often done during production, but Coogler felt it was the best way to capture all the action, stunts and special effects in frame on time. 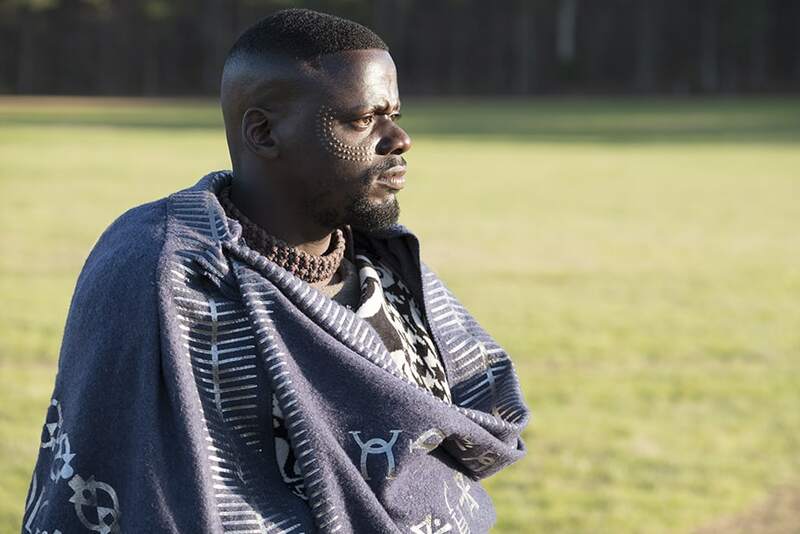 Actor Daniel Kaluuya learned how to ride a horse as practice to simulate riding W’Kabi’s armored rhino in the film.